Volunteering isn’t just a passion for Beth Forkner Moe — it’s a lifestyle she was destined to have. Moe said she grew up in a home with a stay-at-home mother, who was always keeping busy by lending a helping hand and volunteering for the community. “I just saw volunteering as something you do,” Moe said. As the August Volunteer of the Month, Moe said she is humbled and often finds there are many people in the community who deserve to be recognized for the work they do. She said she knows many community volunteers — and plenty of places know her. Moe works as a nonprofit consultant and a freelance writer and editor. She has also spent her free time participating with the Ruskin Club, Habitat for Humanity, Engage Winona, Bluffview Montessori School, Winona County Alliance for Substance Abuse Prevention, the Rotary Club of Winona, the Winona Area Chamber of Commerce and as a friend of the Drug Court. 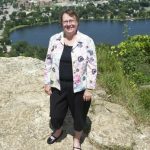 She also was active with the United Way of the Greater Winona Area during its time in the community.